This is the first recipe that my sister and I ever made off of Pinterest. That’s right kids, I can remember when Pinterest was first a thing (and Facebook, and email….but let’s not date ourselves here). I visited my little sister at college and we made these Oreo cheesecakes and some delicious balsamic pasta. 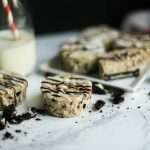 Her birthday is TOMORROW so these bite-size mini Oreo cheesecakes seemed like the proper way to celebrate! Yes, I did just make something for my birthday and my brother’s birthday. We’re all summer babies, and when we were younger our family would celebrate with one big Birthday Bash. All of the cousins with summer birthdays would have one huge party, a massive cake, and we took turns opening presents. On our parent’s part, it was sheer brilliancy. 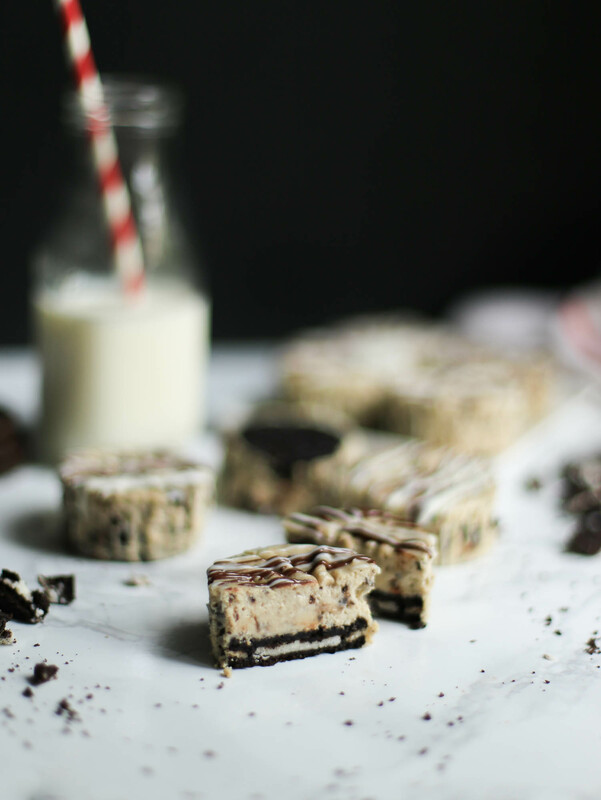 Also worth mentioning, I won an award for these Oreo cheesecakes. No joke. Okay, so it was only an office bake-off competition, but still. I was the newest staff member, and these little bite-size cakes of goodness earned me first place. And bragging rights, forever. These cheesecakes are a perfect dessert for any time of year (or any baking competition), but in the summer chilled desserts definitely get bonus points. 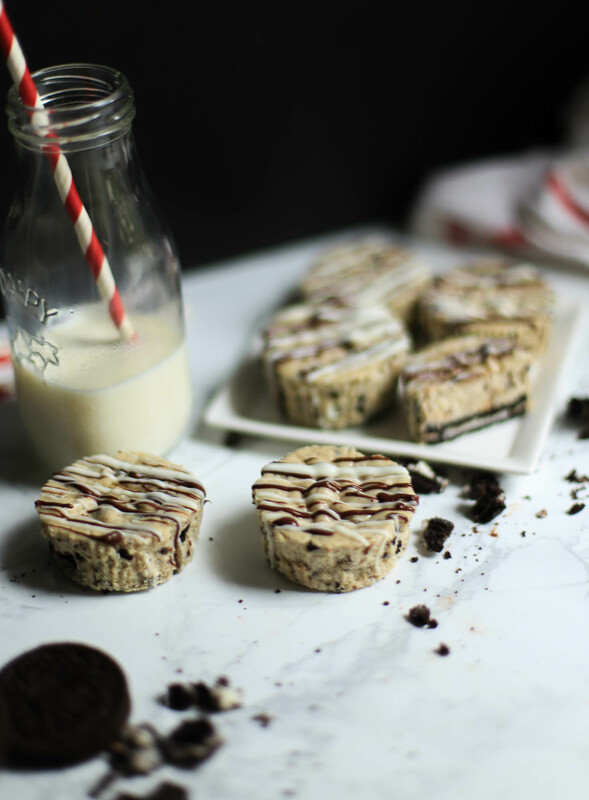 My sister always loved the Hershey’s Cookies & Cream candy bars so it only seems natural that the grown-up alternative would be mini Oreo cheesecakes. 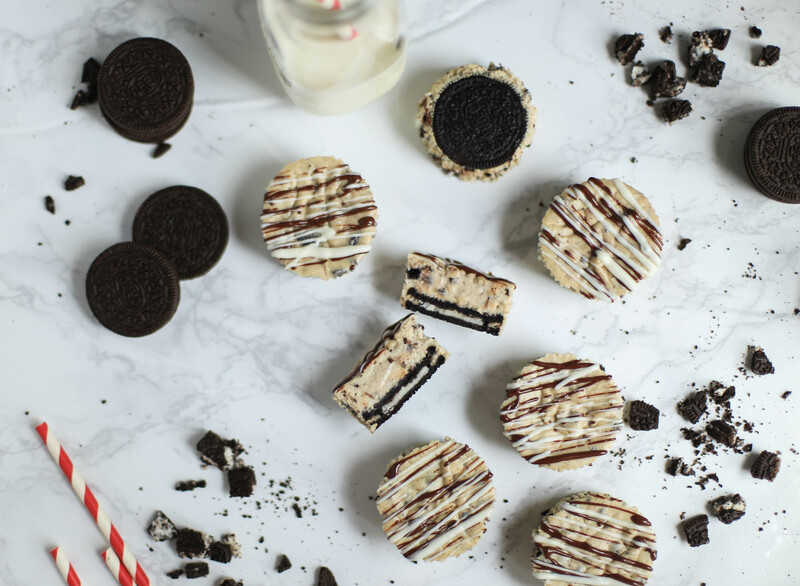 There are not only Oreos on the bottom of each mini cheesecake, but there are also crushed cookies mixed into the cheesecake. Yes, yes it is wonderful. My favorite part of this recipe though: it gives you a perfectly viable excuse to buy and open a package of Oreos. For the recipe, you only need 22 cookies. That leaves the whole rest of the package to be eaten as you wish, but I always go for the classic – dipped in milk. Cheesecake may seem intimidating to the beginner baker but I’m here to tell you that in mini form, it’s not. I love cheesecake but baking an entire cheesecake seems ridiculous. So baby steps. The first time we made this recipe off of Pinterest, it worked. No rocket science behind it (unlike bread baking, don’t even get me started). Mix everything together, pour it into the muffin cups, and bake. My sister is the true baker among the siblings (she feeds me macarons and I love her very much), but even I can handle these mini cheesecakes. 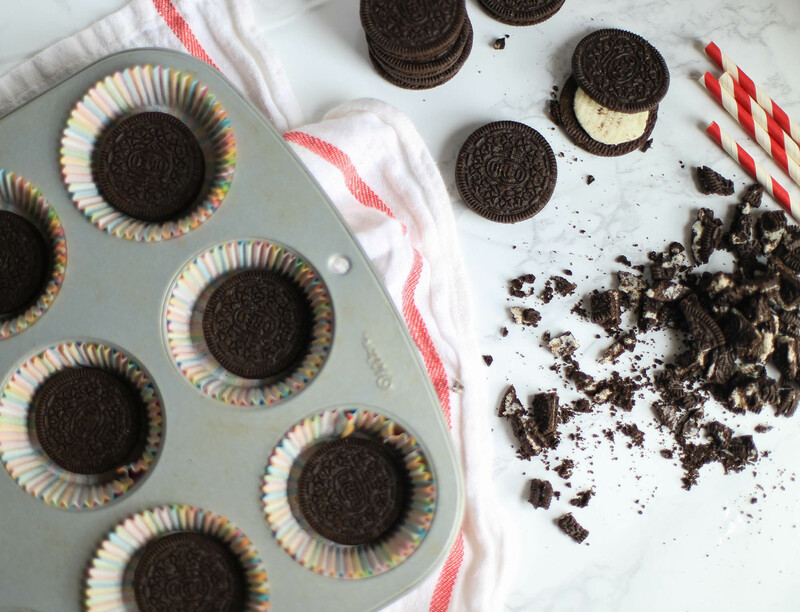 Since they can be made ahead of time, mini Oreo cheesecakes make a great surprise dessert after dinner. Bring out a plate of these, and you will have some happy guests. The cheesecakes can be ready to serve, are already portioned out – no extra prep necessary, and everyone gets their own. Sharing? What is that? Preheat the oven to 275 degrees F. Line a muffin tin with paper cupcake liners. Place a whole Oreo cookie on the bottom of each paper liner. In a large bowl, beat the cream cheese on medium-high speed until smooth. Add in the sugar and mix until combined. Mix in the vanilla, followed by the eggs. Add the Greek yogurt and salt and beat until incorporated. 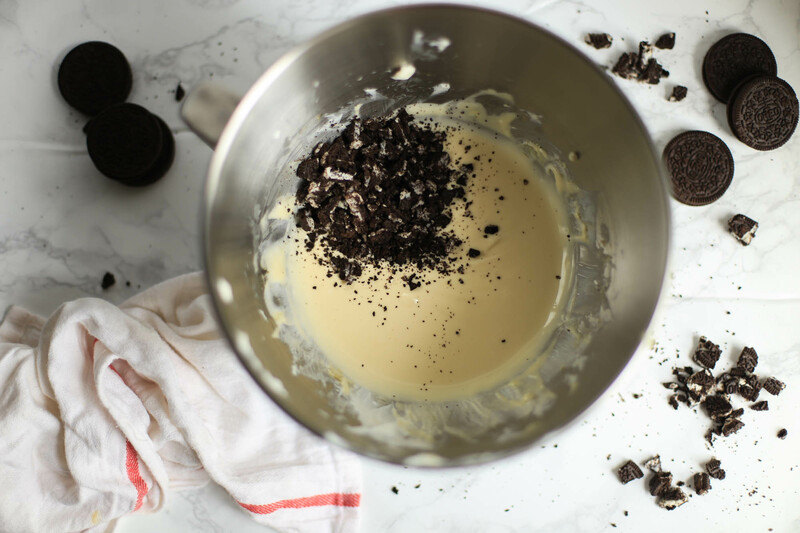 Stir in the crushed Oreos by hand. Evenly divide the batter into the lined muffin cups. Fill each cup almost to the top of the liner. Bake for 18-25 minutes. until the filling is just barely set - or even still a tiny bit jiggly. Transfer the muffin tin to a wire rack to cool completely. 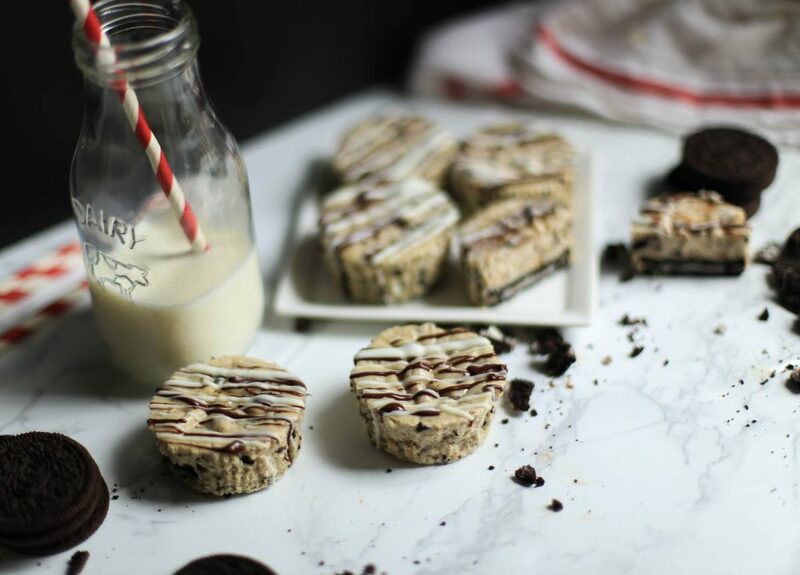 If adding the drizzle, place the semisweet chocolate in a glass bowl and add one teaspoon shortening. Melt in the microwave, stirring regularly. If the chocolate is not thin enough after being melted, add a little more shortening. Use a fork to drizzle the chocolate over the cheesecakes. (Place wax paper under the muffin tin to help with easier clean-up.) Repeat the process with the white chocolate. Refrigerate for at least 3 hours before serving. Serve cold. Let the ingredients come to room temperature before combining, so that they will incorporate easier, and make a smoother filling. Extra mini cheesecakes can be stored in an airtight container in the refrigerator for 4-5 days.